Note in this water vapor image all the dry air to the north and west of the front running system(black represents dry air), but the moist air that’s been left behind for the follower to move into. 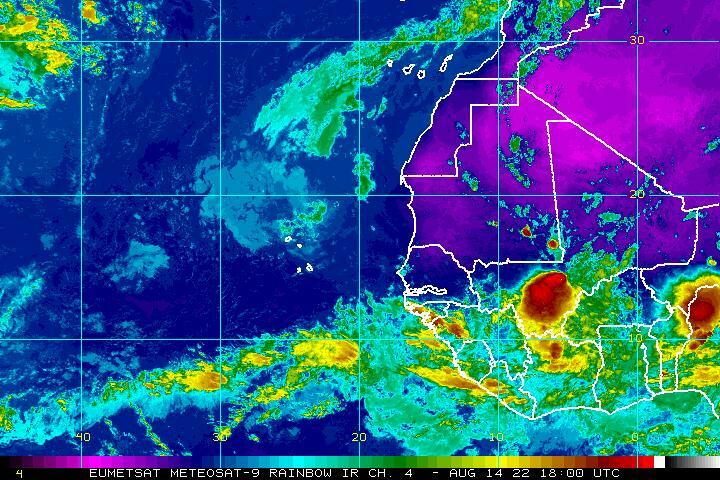 Finally, there are things to talk about in the tropical Atlantic basin. We will see our first named storm which will be Ana in the next day or so, or possibly even today. 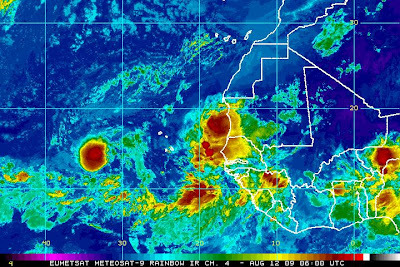 The first system that pushed off the Africa coast about 36 to 48 hours ago looked very impressive, then appeared to dissipate, however the nocturnal fluctuations is showing it’s reflaring of strong and intense thunderstorms blowing up around the center of this circulation at the moment. 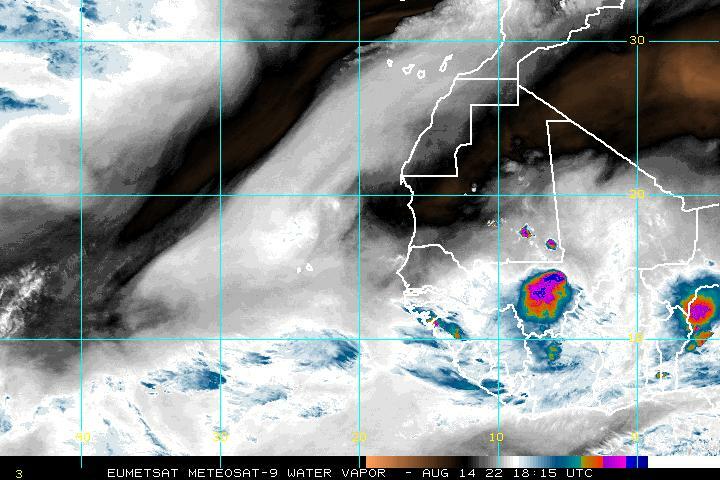 It is in fact tangling up in very dry air that has lingered across the eastern Atlantic for the past couple of months and of course this very dry air has been one of several factors in which has supressed tropical development up until now. 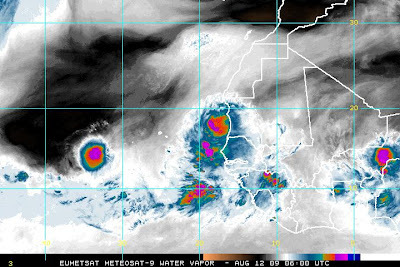 Another, bigger circulation is now just leaving the Africa coast as you can see and will follow the path of the front runner that could develop into Tropical Storm Ana, possibly when the sun comes up and close study is obtained by the National Hurricane Center, but what’s important here to look at is that as the front running system now well west of Africa pushing west, northwest, it’s the complex now leaving Africa that could be the key to trouble down the road in the 10-day period. The front runner is “plowing” away the dry, dusty air and the follower has a better, moisture rich atmosphere to move into. So even though the front runner may develop first, the second system will likely become the stronger of the two as the system to the west is clearing the way with the second taking advantage of the moistening up of the atmosphere. Many computer models out there are jumping on the “second” system and develops this system into a full blown hurricane. Some forecasts call for this thing to become a catagory 3 hurricane and takes it into the East Coast of the US late next week. Modelling are very inaccurate when talking this far out, however the two system could become hurricanes. The weaker they remain as they make their way across the Atlantic, the further south they will stay as they push west, as soon as a storm cranks up and literally peaks, it hits the higher atmosphere and this upper-level region of the atmosphere is where westerly flow is, so ultimately a weaker system that tracks west is getting transported along by low to mid-level “easterlies” but once the strong builds vertically, it gets influenced by high level westerlies as then gets redirected north and then east, ultimately moving into cooler and finally colder waters of the North Atlantic where it dies or becomes a cold core low pressure that gets picked up by the jet stream and gets landed somewhere in the region of the UK. I instend to pay close attention to these two systems which look interesting and have likely threats to the US NEXT WEEK as models see hurricanes develop and run around a multi-layerd mid-Atlantic high pressure system, which should keep it from turning north during it’s westward progression. A perfect set-up for systems to get brought towards the Eastern Seaboard is when a ridge forms over the east coast, whether it be a westward move of the Bermuda high or the forming of a ridge over the East Coast and a trough into the heart of the United States, this attracts a hurricane or storm towards the path of least resistence and between the ridge and trough is likely the path a tropica cyclone will take. So, these are interesting days ahead and I shall keep right on top of the very latest in the tropics and keep you updated. Do indeed check out Accuweather for the latest expert analysis as well as the National Hurricane Centers latest.